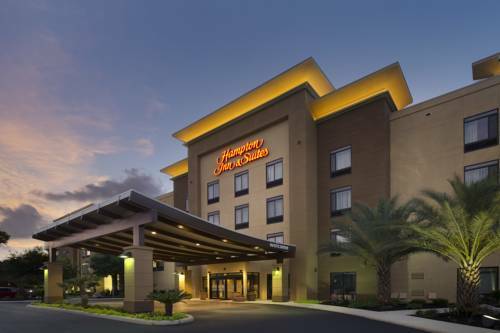 Conveniently located off I-10 Hampton Inn - Suites San Antonio Northwest/Medical Center is just moments from the San Antonio Medical Center and only a few blocks from the United Services Automobile Association /USAA/. Guests at this San Antonio Texas hotel can enjoy easy access to a wealth of retail dining and entertainment opportunities. Discover fantastic shops restaurants and nightlife in downtown San Antonio. explore the charming leafy San Antonio River Walk and visit the most famous historical site in Texas. the Alamo. Treat the kids to a fun day out at SeaWorld San Antonio or Six Flags Fiesta Texas - easily reached from our friendly hotel in San Antonio TX. Feel at home in a spacious guest room or suite and enjoy modern amenities including a microwave and a mini-refrigerator. Check emails with free WiFi at the ergonomic desk watch movies on the flat-screen TV and sleep soundly on the clean and fresh Hampton bed. Join us each morning for Hampton*s free hot breakfast buffet offering everything from hot items to light continental favorites. Our 24-hour Suite Shop stocks a variety of drinks snacks and sundries. Exercise at this hotel in San Antonio TX in the free fitness center or refresh with a dip in the indoor swimming pool. Our modern meeting room is ideal for events for up to 40 people. Friendly service clean rooms comfortable surroundings every time. If you*re not satisfied we don*t expect you to pay. That*s our commitment and your guarantee. That*s 100 Hampton. All reservations must be guaranteed with a major credit card or advance cash deposit to hotel regardless of time of arrival. All reservations must be cancelled by 11:59pm the night prior to arrival unless deposit is required. Policy is subject to change. All reservations must be cancelled by 11:59pm the night prior to arrival unless deposit is required. If this reservation has been made electronically please cancel it electronically to avoid confusion and a no show bill. Policy is subject to change.